In October I visited Chicago for a brief overnight trip, and was determined to make my way to the Art Institute. I had exactly one hour. Clearly my ambitions were outweighed by the sheer size of the Art Insititute’s collection, but luckily a docent was prepared to take my challenge head on by giving me a “one hour guide” to the museum’s legendary works. I decided to forego the guide and headed straight to the Modern Wing which is a perfect vessel for containing the museum’s 20th and 21st century collections. Upon entering the museum I was struck by a unique installation contained within the Grand Staircase. 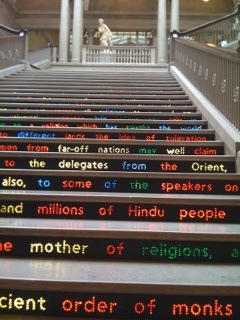 Jitish Kallat’s Public Notice 3 is a series of embedded LED lights displayed in the risers between the stairs. The installation is a commentary on religious tolerance providing a fascinating juxtaposition between the terrorist attacks of 9/11 and a poignant speech delivered by Swami Vivekanda at the first World Parliament of Religions held on September 11, 1893. 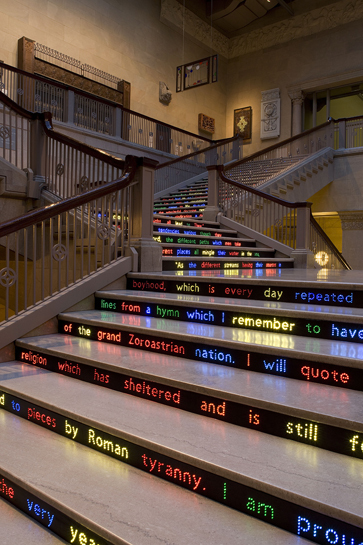 The text of the speech is displayed in LED lights corresponding to the Dept Homeland Security’s color coded terror threat alerts. This piece challenges viewers to contemplate how religious tolerance continues to be buffeted by religious fanaticism. Public Notice 3 is a sobering commentary on the religious polarization of our society and is further punctuated by the current state of political discourse today. 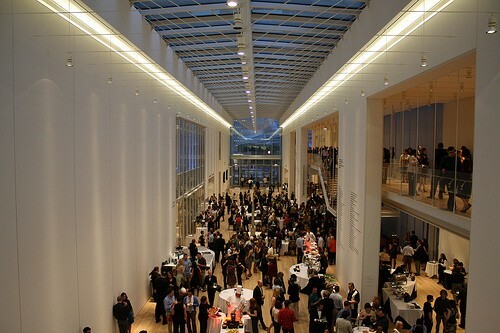 The Modern Wing, is an airy, open expansion of the museum designed by Renzo Piano and opened in 2009. The architecture of the wing is an aesthetic departure from the neo classical Art Institute, but is an appropriately designed building for the Modern and Contemporary Art showcased here. Renzo Piano’s theory on design is that “architecture must fly: it is made of emotions, tensions , transparency.” The building’s design and the layout of the interior of the space provide a cohesive bond with the works on display. Curatorially speaking this wing is smart in it’s linear and clearly categorized layout. The Abstract Expressionist works of Ellsworth Kelly and my favorite painter Mark Rothko were placed in a gallery space flooded with natural light. I have seen both of these artists displayed in very different museums but in the open, natural light the works look completely different. I was surprised to see that the representative works of Contemporary artists were a bit sparse, but the Museum was able to compensate for this by curating their Contemporary collection in an encyclopedic manner. It gives novices of contemporary art a good overview of the dominant players in the genre. Warhol, Pollock, Lichtenstein, Cindy Sherman and Philp Guston are all displayed with one or two pieces. It is almost as if the curators were challenged to distill the essence of an artist into one or two pieces. Their selections are reflective of the artist’s essence. I was particularly consumed by the work of Martha Rosler in “Bringing the War Home: House Beautiful” which is a photomontage of ads, Life magazine spreads and photojournalism that force the harsh realities of war into the utopian homes of middle class, suburban families. It’s a shockingly clever social commentary on the effects of war. An hour in the Modern wing only scratches the surface of what the Art Institute has to offer. I was very impressed by the collection of work by Renoir and I spent a considerable amount of time with Seurat’s “A Sunday on La Grande Jatte”. My brief visit was a pleasant surprise and I look forward to a return visit to experience the artistic diversity on display here. WOW! You certainly made the most of your brief time there, my interest is peaked. I was moved to pull up Seurat’s “A Sunday on La Grande Jatte” as I am unfamiliar with this piece and would love to read your thoughts sometime. It’s immensely gratifying to experience these visits through your eyes and words. Thank you for sharing. Previous Previous post: Art, Drinks and Food Trucks: A Match Made in Heaven or a Recipe for Disaster?